sloth knits: Oh, you meant THAT France. Oh, you meant THAT France. For the second TdF KAL intermediate sprint challenge, I decided to take the France option and cook up something French from this site (kindly listed by TdF KAL co-organizer Meg). Wouldn't you know it, but I managed to pick an ITALIAN dish! I'm generally not a cooking fiend, but I do enjoy making risotto once in a while so I chose the Stage 15 recipe before realizing I was in the wrong country, so to speak. On the other hand, the cyclists head to Italy in Stage 15, so I guess that makes it okay...? Anyway, here's my version of the Mushroom Risotto. 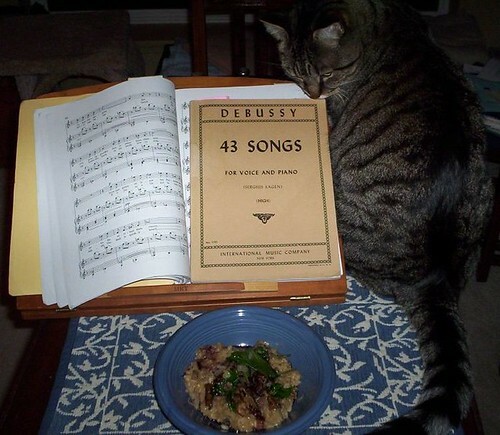 I tried to ratchet up the French mojo by adding some Debussy and Fauré sheet music and a placemat that I think is French. The cat may or may not have spoiled the effect. Modifications: I used dried mushrooms instead of fresh, so instead of chicken stock and porcini powder I added the water left over from soaking the mushrooms. I think chicken stock would have worked better...next time I'll probably use half of each. I think there was another modification but I forget what it was. Oh yeah, getting a bit carried away and making the whole shebang last night at 11 pm instead of, say, today before dinner. 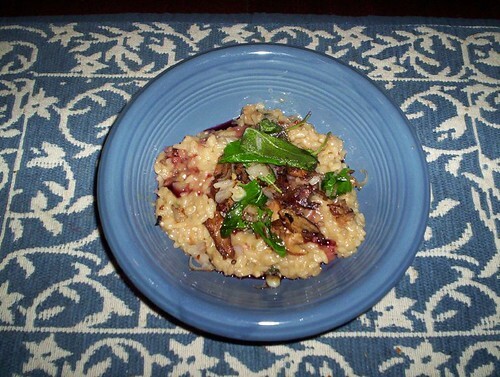 mmm, I love risotto and I am so happy you found something to make on that site. Gabriel Gate's 5-minute cooking segments on my local Tour broadcast over the past few years has revolutionised my kitchen!